One of the many joys of Android is the freedom of choice. This freedom manifests itself in various ways, from being able to choose your email client, media player, and camera apps, all the way to being able to choose an alternative keyboard. Not that there’s anything wrong with the stock keyboard, especially after the sliding gesture support added in Jelly Bean, but some prefer to sample other available options. One such option is TouchPal Keyboard. Launching as an exclusive beta on the XDA forums, TouchPal Wave is the next generation of TouchPal. What makes it unique? For starters, the keyboard is almost entirely customizable. From downloadable skins to button sizes and other typing preferences, users can tailor the keyboard to their own typing style. Next, the keyboard allows you to visually keep tabs of just how much time you’re saving. But most significantly, TouchPal Wave offers three methods of input entry that can all be used seamlessly. Standard Typing with Advanced Word Prediction: In addition to simply tapping on the letters you wish to use, TouchPal Wave offers an impressive word prediction algorithm that can guess the words you plan to use next before you even begin to type them. This method is reminiscent of the advanced prediction in a few other keyboards such as SwiftKey. TouchPal Curve: This entry method is similar to the gesture typing popularized by Swype, and now also seen in quite a few keyboards including the default keyboard in Jelly Bean. Simply slide your fingers across the screen, and your words are assembled from probability maps based on the letters over which you have traced. 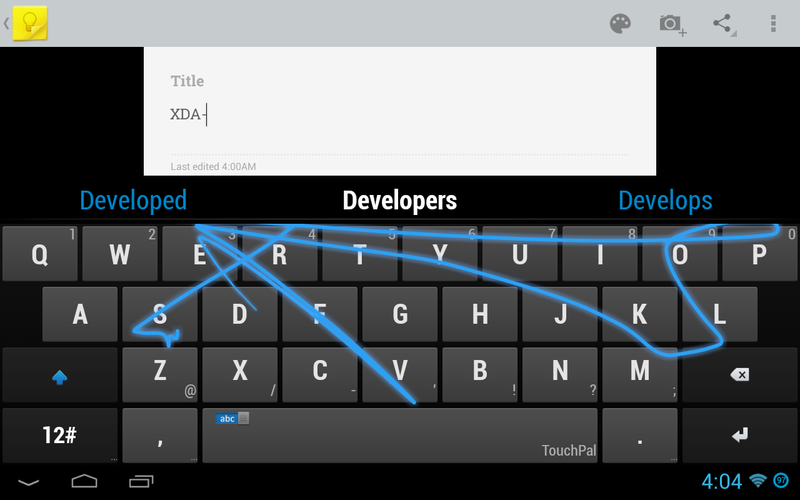 TouchPal Wave: This keyboard’s namesake entry method is, in a way, a combination of the first two input methods. It allows you to use the advanced word prediction seen in the first entry method in a new and streamlined way. You begin by inputting a few letters. Once you see a (correct) prediction, slide your finger from the prediction to the spacebar. Once your finger reaches the spacebar, a new set of predictions will appear. Without releasing your finger, drag over to the next suitable prediction, and so on. So how does the keyboard work? Despite its beta status, I would say quite well. In my admittedly limited testing, word prediction seems intuitive and gesture typing offers accuracy at least on par with the competition. However, the keyboard’s namesake is where things get interesting. Once Wave has learned your typing style, it offers a powerful and intuitive method of rapidly accepting predictions. While more of a novelty at first, as its predictions become more useful, the Wave feature will shave more and more time from each successive sentence. While TouchPal Wave keyboard may not be for everyone, it’s definitely worth a shot for anyone who wants to try something new. Launching exclusively as a free and open beta on the XDA-Developers forums, simply head over to the application thread to get started.